Maybe it is because I am not a tea expert (I love coffee, what can I say), but when I think of a country with good tea traditions England certainly comes to my mind. As you all know, I’ve been living in London for quite a while and I wanted to make sure I am experiencing all the english traditions. But then a lot of questions pop into my mind: where should I go? what should I expect? how much should I pay? Thank God there’s a majestic website to assist you through the whole process and help you out finding the best offers and spots for afternoon tea in the City. It is quite an expensive tradition, so it is always good to have some guidance. You would be quite surprised to know that afternoon tea is THE thing in terms of deluxe experiences. And because of that, you will need to book your package in advance (up to 3 months!) to have a spot at the best places (usually hotels) serving afternoon tea. I’ve heard about a lot of hotels where you could have amazing afternoon tea. However, my three personal picks go for the Mad Hatters Tea at the Sanderson Hotel, the Prêt-à-PorTea at The Berkeley Hotel and Afternoon tea at The Ritz. Of course there are many other places where you could enjoy this high-end tea experience, but I’d say this three are a classic. Having that in mind, I’d like to tell you about my experience at the Sanderson Hotel. It is funny because when you are spending about 30 to 50 pounds on such a delightful and exciting experience, you would think you are going to a very fancy/ good looking place, but that was not the first impression I got when I stood outside the hotel. However, that changed as soon as I went in. The Hotel has been redecorated into a very modern style, with clear chairs haging from the ceiling to lips sofas (very comfy, I must say) where you could chile while waiting for your table. The hotel also counts with an amazing bar and a lovely terrace, where we had our afternoon tea. Another thing that surprised me is that it is called “afternoon tea”, but you could actually go from 10am in the morning until 7pm in the evening. Which pretty much means you can do it whenever. However, considering you are about to indulge some serious amount of food, I think the best timing to do it is between 12pm and 4pm. The experience at the Sanderson hotel was quite unique. As soon as you enter the terrace it feels you are on a fairy tale. 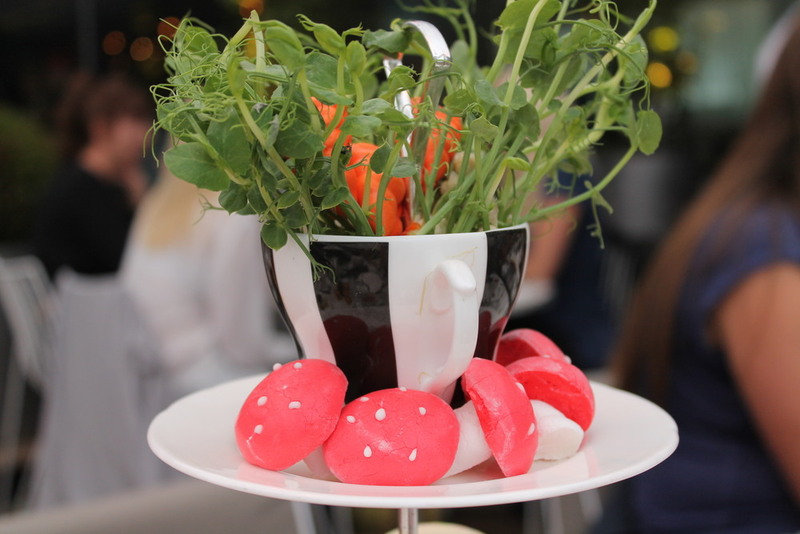 This particular afternoon tea is inspired in Alice in Wonderland, so everything was themed to make you feel as if you are one of the Mad Hatter’s party guests. 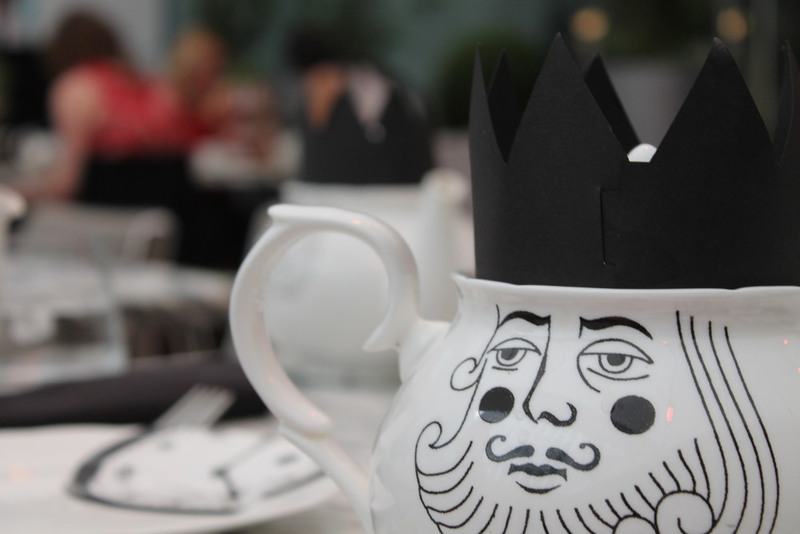 The menus are hidden in antique books of Alice in Wonderland and the tea selection comes in little bottles for you to smell and decide which tea you are goning to have. All the cutlery and plates are themed and your napkins come with riddles to entertain you while you are waiting for your food. Oh, and the food. As I said, I’m not an expert on tea delights but I think the food trays are the cutest thing. Piled in different tiers, you’ll get a wide range of savory and sweet delights that will make you feel you are in food heaven. All sorts of sandwiches, little cakes, lots of scones…that is what you should always expect to get out of your tea experience. However, there is always much more stuff. In conclusion, I think it is a fantastic idea to embark yourself in such an experience with you girlfriends. I say girlfriends because I can hardly think of any guy who would be up for paying such an amount of money for feeling like a princess while drinking tea and eating cucumber sandwiches, as my boyfriend would say. But it is not only the great tea and extraordinary food that you are after when going for afternoon tea. It is the idea of self indulgence, of treating yourself, of dressing up and having a good time with your friends while in an amazing hotspot in the City. The food tray included: carrot meringue and mushroom shaped marshmallows on the 1st tier, victoria sponge cake and mango cheesecake on the 2nd tier and passion fruit and coconut creme "Drink Me" potions, Green Tea chocolate cups, and a selection of savoury and sweet scones on the 3rd and last tier. The savoury treats included a selection of the following finger sandwiches: Smoked Cumbrian Ham with whole grain mustard on sun-dried tomato bread, Cucumber and Chive Cream Cheese on Spinach Bread, Cold Smoked Salmon and Lemon Butter on Dark Rye Bread, Egg Mayonnaise With water cress and smoked sea salt on lemon bread and a mini quiche.